Montane ecosystems refers to any ecosystem found in mountains. These ecosystems are strongly affected by climate, which gets colder as elevation increases. They are stratified according to elevation. Dense forests are common at moderate elevations. However, as the elevation increases, the climate becomes harsher, and the plant community transitions to grasslands or tundra. As elevation increases, the climate becomes cooler, due to a decrease in atmospheric pressure and the adiabatic cooling of airmasses. The change in climate by moving up 100 meters on a mountain is roughly equivalent to moving 80 kilometers (45 miles or 0.75° of latitude) towards the nearest pole. The characteristic flora and fauna in the mountains tend to strongly depend on elevation, because of the change in climate. This dependency causes life zones to form: bands of similar ecosystems at similar altitude. One of the typical life zones on mountains is the montane forest: at moderate elevations, the rainfall and temperate climate encourages dense forests to grow. Holdridge defines the climate of montane forest as having a biotemperature of between 6 and 12 °C (43 and 54 °F), where biotemperature is the mean temperature considering temperatures below 0 °C (32 °F) to be 0 °C (32 °F). Above the elevation of the montane forest, the trees thin out in the subalpine zone, become twisted krummholz, and eventually fail to grow. Therefore, montane forests often contain trees with twisted trunks. This phenomenon is observed due to the increase in the wind strength with the elevation.The elevation where trees fail to grow is called the tree line. The biotemperature of the subalpine zone is between 3 and 6 °C (37 and 43 °F). Above the tree line the ecosystem is called the alpine zone or alpine tundra, dominated by grasses and low-growing shrubs. The biotemperature of the alpine zone is between 1.5 and 3 °C (34.7 and 37.4 °F). Many different plant species live in the alpine environment, including perennial grasses, sedges, forbs, cushion plants, mosses, and lichens. Alpine plants must adapt to the harsh conditions of the alpine environment, which include low temperatures, dryness, ultraviolet radiation, and a short growing season. Alpine plants display adaptations such as rosette structures, waxy surfaces, and hairy leaves. Because of the common characteristics of these zones, the World Wildlife Fund groups a set of related ecoregions into the "montane grassland and shrubland" biome. Climates with biotemperatures below 1.5 °C (35 °F) tend to consist purely of rock and ice. 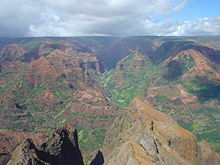 Waimea Canyon, Hawaii is known for its montane vegetation. Montane forests occur between the submontane zone and the subalpine zone. The elevation at which one habitat changes to another varies across the globe, particularly by latitude. The upper limit of montane forests, the forest line or timberline, is often marked by a change to hardier species that occur in less dense stands. For example, in the Sierra Nevada of California, the montane forest has dense stands of lodgepole pine and red fir, while the Sierra Nevada subalpine zone contains sparse stands of whitebark pine. The lower bound of the montane zone may be a "lower timberline" that separates the montane forest from drier steppe or desert region. Montane forests differ from lowland forests in the same area. The climate of montane forests is colder than lowland climate at the same latitude, so the montane forests often have species typical of higher-latitude lowland forests. Humans can disturb montane forests through forestry and agriculture. On isolated mountains, montane forests surrounded by treeless dry regions are typical "sky island" ecosystems. Montane forests in temperate climate are typically one of temperate coniferous forest or temperate broadleaf and mixed forest, forest types that are well known from northern Europe, northern United States, and southern Canada. The trees are, however, often not identical to those found further north: geology and climate causes different related species to occur in montane forests. Montane forests around the world tend to be more species-rich than those in Europe, because major mountain chains in Europe are oriented east-west. Montane forests in temperate climate occur in Europe (the Alps, Carpathians, Caucasus and more), in North America (Cascade Range, Klamath-Siskiyou, Appalachians and more), south-western South America, New Zealand and Himalaya. Montane forests in Mediterranean climate are warm and dry except in winter, when they are relatively wet and mild. These forests are typically mixed conifer and broadleaf forests, with only a few conifer species. Pine and Juniper are typical trees found in Mediterranean montane forests. The broadleaf trees show more variety and are often evergreen, e.g. evergreen Oak. This type of forest is found in the Mediterranean Basin, North Africa, Mexico and the southwestern US, Iran, Pakistan and Afghanistan. 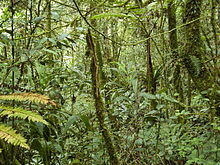 In the tropics, montane forests can consist of broadleaf forest in addition to coniferous forest. One example of a tropical montane forest is a cloud forest, which gains its moisture from clouds and fog. Cloud forests often exhibit an abundance of mosses covering the ground and vegetation, in which case they are also referred to as mossy forests. Mossy forests usually develop on the saddles of mountains, where moisture introduced by settling clouds is more effectively retained. Depending on latitude, the lower limit of montane rainforests on large mountains is generally between 1,500 and 2,500 metres (4,900 and 8,200 ft) while the upper limit is usually from 2,400 to 3,300 metres (7,900 to 10,800 ft). 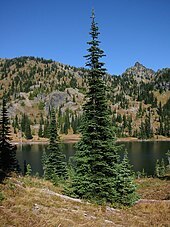 The subalpine zone is the biotic zone immediately below the tree line around the world. In tropical regions of Southeast Asia the tree line may be above 4,000 m (13,000 ft), whereas in Scotland it may be as low as 450 m (1,480 ft). Species that occur in this zone depend on the location of the zone on the Earth, for example, snow gum in Australia, or subalpine larch, mountain hemlock and subalpine fir in western North America. Trees in the subalpine zone often become krummholz, that is, crooked wood, stunted and twisted in form. At tree line, tree seedlings may germinate on the lee side of rocks and grow only as high as the rock provides wind protection. Further growth is more horizontal than vertical, and additional rooting may occur where branches contact the soil. Snow cover may protect krummholz trees during the winter, but branches higher than wind-shelters or snow cover are usually destroyed. Well-established krummholz trees may be several hundred to a thousand years old. Meadows may be found in the subalpine zone. Tuolumne Meadows in the Sierra Nevada of California, is an example of a subalpine meadow. Example subalpine zones around the world include the French Prealps in Europe, the Sierra Nevada and Rocky Mountain subalpine zones in North America, and subalpine forests in the eastern Himalaya, western Himalaya, and Hengduan mountains of Asia. Alpine grasslands and tundra lie above the tree line, in a world of intense radiation, wind, cold, snow, and ice. As a consequence, alpine vegetation is close to the ground and consists mainly of perennial grasses, sedges, and forbs. Annual plants are rare in this ecosystem and usually are only a few inches tall, with weak root systems. Other common plant life-forms include prostrate shrubs, graminoids forming tussocks, and cryptogams, such as bryophytes and lichens. Plants have adapted to the harsh alpine environment. Cushion plants, looking like ground-hugging clumps of moss, escape the strong winds blowing a few inches above them. Many flowering plants of the alpine tundra have dense hairs on stems and leaves to provide wind protection or red-colored pigments capable of converting the sun's light rays into heat. Some plants take two or more years to form flower buds, which survive the winter below the surface and then open and produce fruit with seeds in the few weeks of summer. Non-flowering lichens cling to rocks and soil. Their enclosed algal cells can photosynthesize at any temperature above 0 °C (32 °F), and the outer fungal layers can absorb more than their own weight in water. Alpine meadows form where sediments from the weathering of rocks has produced soils well-developed enough to support grasses and sedges. Alpine grasslands are common enough around the world to be categorized as a biome by the World Wildlife Fund. The biome, called "Montane grasslands and shrublands", often evolved as virtual islands, separated from other montane regions by warmer, lower elevation regions, and are frequently home to many distinctive and endemic plants which evolved in response to the cool, wet climate and abundant sunlight. The most extensive montane grasslands and shrublands occur in the Neotropic páramo of the Andes Mountains. This biome also occurs in the mountains of east and central Africa, Mount Kinabalu of Borneo, highest elevations of the Western Ghats in South India and the Central Highlands of New Guinea. A unique feature of many wet tropical montane regions is the presence of giant rosette plants from a variety of plant families, such as Lobelia (Afrotropic), Puya (Neotropic), Cyathea (New Guinea), and Argyroxiphium (Hawaii). Where conditions are drier, one finds montane grasslands, savannas, and woodlands, like the Ethiopian Highlands, and montane steppes, like the steppes of the Tibetan Plateau. California montane chaparral and woodlands, an ecoregion. Angolan montane forest-grassland mosaic, an ecoregion. Australian Alps montane grasslands, an ecoregion. ^ Goody, Richard M.; Walker, James C.G. (1972). "Atmospheric Temperatures" (PDF). Atmospheres. Prentice-Hall. Archived (PDF) from the original on 29 July 2016. ^ Blyth, S.; Groombridge, B.; Lysenko, I.; Miles, L.; Newton, A. (2002). "Mountain Watch" (PDF). UNEP World Conservation Monitoring Centre, Cambridge, UK. p. 15. Archived from the original (PDF) on 11 May 2008. ^ a b c Lugo, Ariel E.; Brown, Sandra L.; Dodson, Rusty; Smith, Tom S.; Shugart, Hank H. (1999). "The Holdridge Life Zones of the conterminous United States in relation to ecosystem mapping" (PDF). Journal of Biogeography. 26 (5): 1025–1038. doi:10.1046/j.1365-2699.1999.00329.x. ^ a b Körner, Christian (2003). Alpine Plant Life: Functional Plant Ecology of High Mountain Ecosystems. Berlin: Springer. ^ a b Price, Larry W. (1986). Mountains and Man: A Study of Process and Environment. University of California Press. p. 271. ISBN 9780520058866. Retrieved 2012-03-09. ^ Rundel, P.W. ; D. J. Parsons; D. T. Gordon (1977). "Montane and subalpine vegetation of the Sierra Nevada and Cascade Ranges". In Barbour, M.G. ; Major, J. Terrestrial vegetation of California. New York, USA: Wiley. pp. 559–599. ^ a b Nagy, László; Grabherr, Georg (2009). The biology of alpine habitats. Oxford University Press. ^ Perry, David A. (1994). Forest Ecosystems. JHU Press. p. 49. ISBN 0-8018-4987-X. Retrieved 2012-03-09. ^ Albert, James S.; Reis, Roberto E. (2011). Historical Biogeography of Neotropical Freshwater Fishes. University of California Press. p. 311. ISBN 0-520-26868-7. Retrieved 2012-03-09. ^ Mulligan, M. (2011). "Modeling the Tropics-Wide Extent and Distribution of Cloud Forest and Cloud Forest Loss, with Implications for Conservation Priority". In Bruijnzeel, L. A.; Scatena, F. N.; Hamilton, L. S. Tropical Montane Cloud Forests: Science for Conservation and Management. Cambridge University Press. pp. 15–38. ISBN 0-521-76035-6. Retrieved 2012-03-09. ^ Clarke, C.M. (1997). Nepenthes of Borneo. Kota Kinabalu: Natural History Publications (Borneo). p. 29. ^ Bruijnzee, L.A.; Veneklaas, E. J. (1998). "Climatic Conditions and Tropical Montane Forest Productivity: The Fog Has Not Lifted Yet". Ecology. 79 (1): 3. doi:10.2307/176859. JSTOR 176859. ^ Blasco, F.; Whitmore, T.C. ; Gers, C. (2000). "A framework for the worldwide comparison of tropical woody vegetation types" (PDF). Biological Conservation. 95 (2): 175–189. doi:10.1016/S0006-3207(00)00032-X. Archived from the original (PDF) on 2012-09-04. Retrieved 2012-03-11. p. 178. ^ Grace, John; Berninger, Frank; Nagy, Laszlo (2002). "Impacts of Climate Change on the Tree Line". Annals of Botany. 90 (4): 537–544. doi:10.1093/aob/mcf222. PMC 4240388. PMID 12324278. fig. 1. 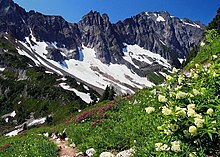 ^ "Subalpine ecosystem". Rocky Mountain National Park. U.S. National Park Service. This article incorporates public domain material from the Bureau of Land Management document: "Grassland Habitat Group" (PDF). Archived from the original (PDF) on 2008-07-24. This article incorporates public domain material from the National Park Service document "Rocky Mountain National Park: Alpine Tundra Ecosystem". Wikimedia Commons has media related to Montane ecoregions.